One of the depressing things about modern gadgets is the mostly bland, grey plastic design of most of the top sellers. OK, so Apple is the standout with its gorgeous designs, but for the most part consumer technology comes in any color you like as long as it’s grey drudge. What the tech world needs is more adventurous designers and marketeers, and this bunch look like they fit the bill. 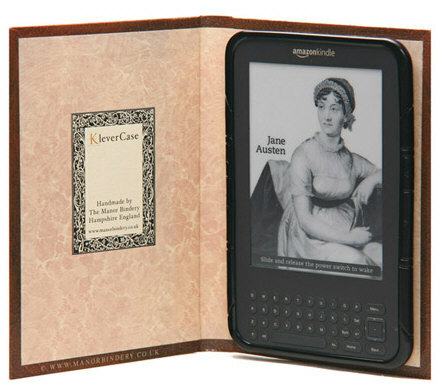 The Klever Case is a masterpiece of retro design, and just perfect to remove the yawn factor from your Kindle ebook reader and transform it into a piece of art. Each case is made from specialist bookbinding materials to give it that authentic appearance and what’s more you can customise the spine title and inner sleeve to say what you like (up to 4 lines of 10 characters) to make it even more special. The case is available for the Kindle 3, Kindle 4, Kindle Touch and Kindle Fire and there’s a range of different classic book cover designs to choose from. Priced from £24.99 and upwards and a fabulous gift for the bookworm in your family we’re thinking.